Regni Hungariae et regionum, quae ei quondam fuere unitae, ut Transilvaniae, Valachiae, Moldaviae, Serviae, Romaniae, Bulgariae, Bessarabiae, Croatiae, Bosniae, Dalmatiae, Sclavoniae, Morlachiae, Ragusanae Reipublicae, maximaeq[ue] partis Danubii Fluminis, novissima delineatio. 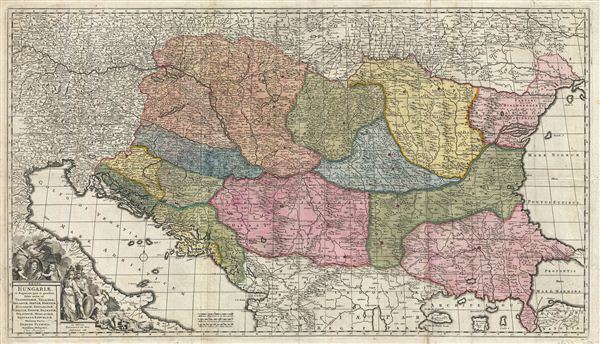 A sprawling 1688 decorative map of the Balkans by Fredrick de Wit. Covering from the Adriatic to the Black Sea and from Poland to Macedonia, this large map focuses on the multiethnic, multilingual, and multinational Hungarian Empire. It includes the modern day nations of Hungary, Romania, Croatia, Bosnia and Herzegovina, Slovenia, Serbia, Moldova, Bulgaria, Kosovo, and parts of Montenegro, Macedonia, Ukraine, and Turkey. Hungary at this time stood divided between Austrian Hapsburg influence from the west and Ottoman influence from the east. In 1683 the Ottoman Empire led a force through this region for a disastrous attack on the Austrian Empire. Beaten back, Ottoman hegemony in the region temporarily waned as Austria managed to conquer what was left of the Hungarian Empire as well as the Principality of Transylvania. A highly decorative title cartouche appears in the lower left quadrant. This map was appeared in many composite atlases of the late 17th century. Good. Some wear on original fold lines. Color refreshed. Archivally backed with Japanese tissue.